Explanation: Can the night sky appear both serene and surreal? Perhaps classifiable as serene in the above panoramic image taken last Friday are the faint lights of small towns glowing across a dark foreground landscape of Doi Inthanon National Park in Thailand, as well as the numerous stars glowing across a dark background starscape. Also visible are the planet Venus and a band of zodiacal light on the image left. Unusual events are also captured, however. First, the central band of our Milky Way Galaxy, while usually a common sight, appears here to hover surreally above the ground. Next, a fortuitous streak of a meteor was captured on the image right. Perhaps the most unusual component is the bright spot just to the left of the meteor. That spot is the plume of a rising Ariane 5 rocket, launched a few minutes before from Kourou, French Guiana. 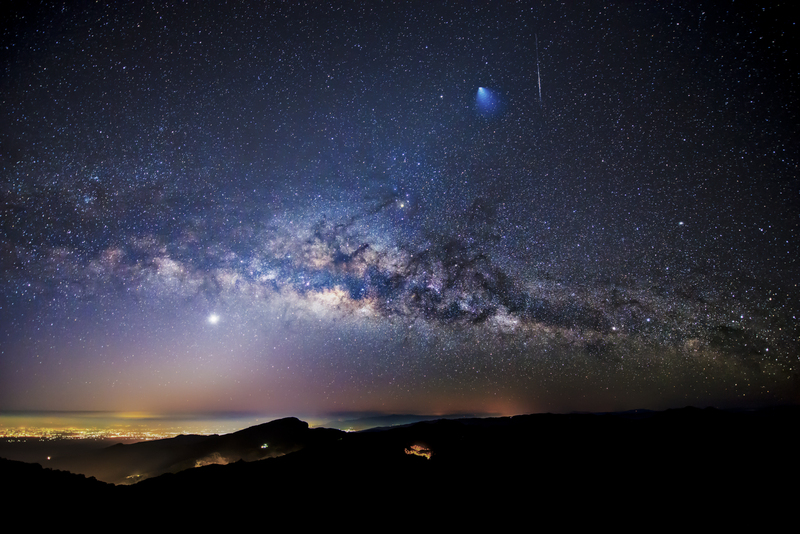 How lucky was the astrophotographer to capture the rocket launch in his image? Pretty lucky -- the image was not timed to capture the rocket. Also lucky was how photogenic -- and perhaps surreal -- the rest of the sky turned out to be.